Fantastic Football Kits in 2 Willow! Year 4: Health Week AND Chocolate topic! During Health Week, each year group was given a country to focus on. We have been looking at the United States of America. This fitted in well because in Design Technology we have been creating our own healthy chocolate bars as part of our Chocolate topic. In Science and PSHE and ICT, we discovered that sugar is highly addictive. This might explain why some sources we researched said over 70 million people in the USA are obese (this means dangerously overweight). So, we designed and made chocolate bars that had less chocolate and more healthy ingredients in its place. It was great to be able to use of lot of what we had learned from our trip to Cadbury World. In Art and Design, we created packaging. In ICT, we wrote and developed animatics for TV ads that promoted our new chocolate brands by using the GarageBand and iMovie apps. Overall, we decided that while we all loved chocolate, we have a responsibility to ourselves and to society not to eat too much of it! Check out some of our final products below . . .
Year 3 have been finding out about Mexico and the Mexican football team. We have also made Day of the Dead masks, this is a famous festival where people remember family and friends that have died. We have had a great week! As part of health week the children in Reception designed and made their own salads! We started by tasting the different salad options and choosing which ones we would like. We tried carrots, peppers, beetroot, sweetcorn, celery, raisins, tomatoes and cucumber! Having designed our salads we then had great fun making them and choosing our favourite dip! We then did the all important part of eating it. We also learnt about the importance of evaluating our salad afterwards and thinking about what we might do differently if we made it again. We also learnt lots of facts about our world cup country, France!! We started by finding out where France is in the world using Google Earth. We learnt that France is in Europe and that you could sail to France on a ferry in no time at all! We know that the capital city is called Paris and has a big river called La Seine running through it. In Paris there is also a very famous tower called the Eiffel Tower! We learnt about the flag and how to count and say simple phrases in French! We were very interested in learning about the different kinds of food you might eat in France. We know in France they like to eat French onion soup, lots of smelly cheese, snails and frogs legs!!! We didn’t fancy trying any snails or frogs legs but our teachers thought it would be a nice idea to have a French breakfast! We all tried crossaints, brioche, pain au chocolat, baguette and jam – it was yummy!! Health Week in Year 2! We have had lots of fun this week in Year 2 celebrating Health Week! We especially enjoyed hearing from our special visitors: a paramedic, police officers and some lovely ladies from Tesco who brought lots of fantastic, healthy food for us to try! This week we have also been learning lots about Brazil because this is the team year 2 have been following in the World Cup. We found out about what this country is like, which sports are popular in Brazil, the wonderful carnivals that happen there and we have been trying delicious fruits from Brazil too! 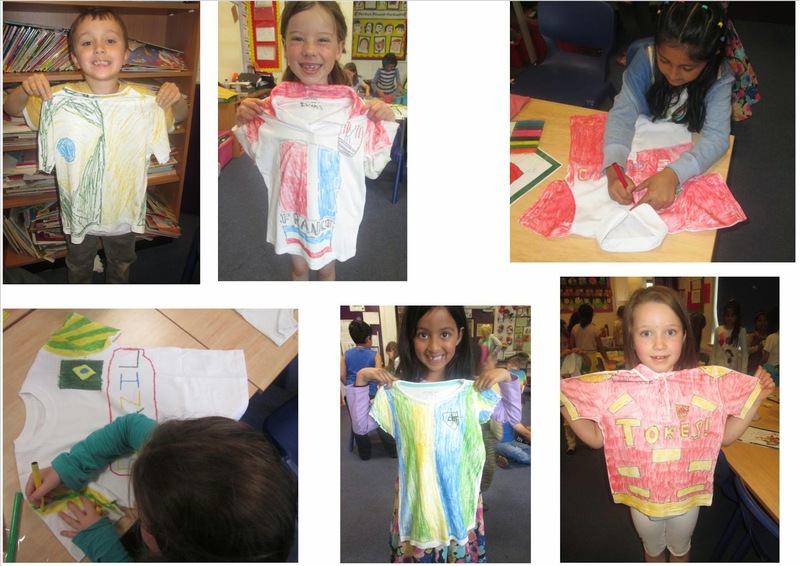 Our favourite part of the week has been designing new football kits for the Brazilian football team! · Argentina’s official language is Spanish. · The currency of Argentina is the peso. · The name of Argentina in Latin is silver. · Did you know that the official name of Argentina was the Argentina Republic? · Argentina has a population of 42 million people! · Can you believe that there are 30 national parks in Argentina? As well as researching about Argentina, Year 6 have also been cooking healthy curries! We made these from scratch – there wasn’t a jar in sight! Have a look at some of our photos and let us know what you think. We have had lots of fun during health week and have completed many health related activities. It all began with an amazing assembly from Mr. Haycock, where he introduced all of the countries our classes would be representing. In PSHE, we have learnt about the 5 elements that make a healthy lifestyle: diet, exercise, hygiene, emotional well-being and home and family. Without all of these 5 elements we wouldn’t be healthy or happy! We worked in groups to mind map what we already knew about each area and then produce a poster using this information. 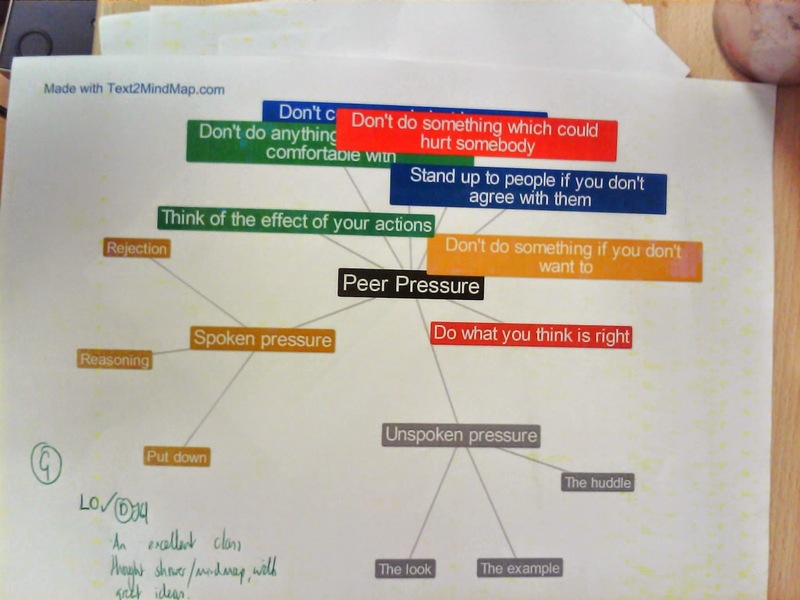 Also, we discussed the term ‘Peer Pressure’, the two types of peer pressure and how to resist pressure to do wrong when we are with our peers. Overall, we have all had a very enjoyable week in year 5 and loved taking part in health week! We have really enjoyed Health Week in Year 1! We have taken part in lots of activities including visits from the Police, the Paramedic and even Tesco's! We have designed and made our very own fresh fruit salad and discovered new fruits that we have not tried before! Also, to celebrate the world cup we have found out lots of interesting information about our country Italy! Italy has lots of interesting cities and yummy food! They have even got a leaning tower in the city of Pisa. We have been learning to speak Italian and created our own Italian flags. Nursery's visit by a paramedic! We started our Health Week off with a brilliant visit from Tom - our friendly paramedic! He helped us to think about how we can stay safe, and showed us some of the things from his ambulance. We felt out heartbeats and watched the heart monitor, as well as seeing how paramedics use a special leg support for people who have hurt their leg. We even got to go outside and switch the blue lights on the ambulance! It was great fun! Our Summer Fair Stall - Bake ‘n’ Make! The summer fair is coming soon and Year 6 will be holding their own stalls. My group’s stall will be making delicious Gingerbread Men and we are selling them for only 35p! Or if you want to decorate your own it’s only 50p! We sincerely hope you come on the 4th of July to buy our fantastic product. We will be decorating them on the afternoon before the fair so the Gingerbread Men will be fresh and tasty! The time of the fair is from 3.15 to 4.30. Thank you and don’t forget! 2013-2014 has been the most successful sporting year ever for Chilcote School. In addition to the boys football, girls football, and girls netball teams that the school run, we get the chance to participate in a range of sports through our partnership with Baverstock. In total we have entered 13 different sports tournaments throughout the year. Approximately 60 different children have represented the school in these tournaments. Furthermore, every child in years 1, 2 and 4 has participated in festivals (multi-skills, multi-skills, and cricket respectively). Chilcote have not finished lower than third in any of these tournaments. We have won a total of 6 tournaments: year 3 and 4 football B team competition; year 5 and 6 mixed hockey tournament; year 5 and 6 mixed sportshall athletics; year 5 and 6 mixed swimming gala; year 5 and 6 mixed tag-rugby; year 5 and 6 quadkids athletics. In addition to winning these tournaments Chilcote also represented the Baverstock partnership in the Winter games festival at Hockey and Sportshall athletics. This meant that the children participated against the winners from all of the partnerships across Birmingham. The hockey team managed to finish 3rd in Birmingham, which was a tremendous achievement. The sportshall athletics squad finished a respectable 6th in the finals. Unfortunately, due to the Redridge residential the Tag-rugby winners, and the quadkids athletics winners did not get to represent the partnership at the Birmingham Summer games despite winning the tournament and qualifying. Chilcote have finished as runners up in 4 tournaments: year 5 and 6 mixed basketball; year 4 mixed tennis; year 4 mixed tri-golf; year 5 and 6 mixed rounders. Unfortunately, being runners up meant we didn’t qualify to represent the partnership in these sports. In addition, the teams finished third in 3 tournaments: year 4 mixed football; year 5 cricket; year 5 and 6 mixed netball. In most tournaments third meant that the team finished about in the middle of the number of teams that entered. Finally, the year 6 football team also had a very successful year. They got to the semi-finals of the HMS cup/shield. They also finished third in the premier league of the South Birmingham football leagues, which means they finished an excellent 3rd out of 18 schools. 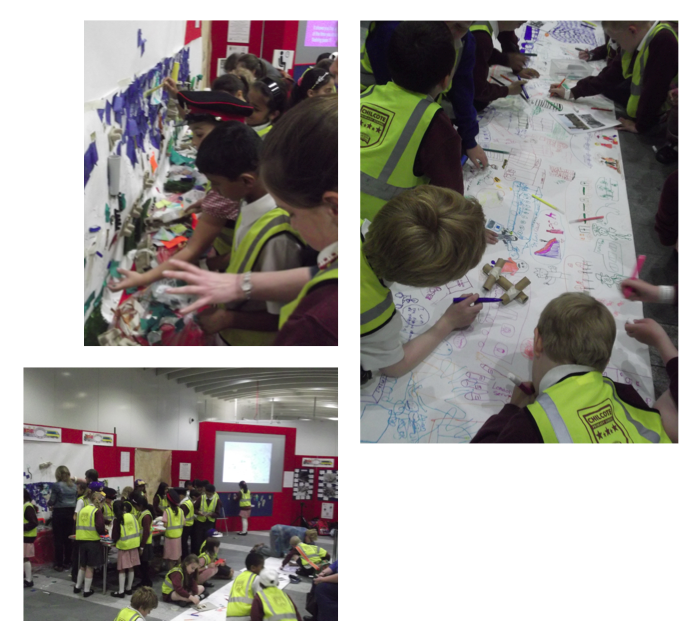 Today, the whole of Year 4 visited New Street Station, which is being rebuilt. In the Spring term, we worked on a local history project, examining how and why New Street Station had changed since the original one was built in 1854. Part of the re-opening in 2015 will feature an exhibit where people will be transported back in time to 1854 through a portal, and . . . we will have designed it! At today’s event, our designs for the portal were displayed on a huge screen for passengers to view. We also contributed with other schools to various pieces of artwork, including an enormous collage. 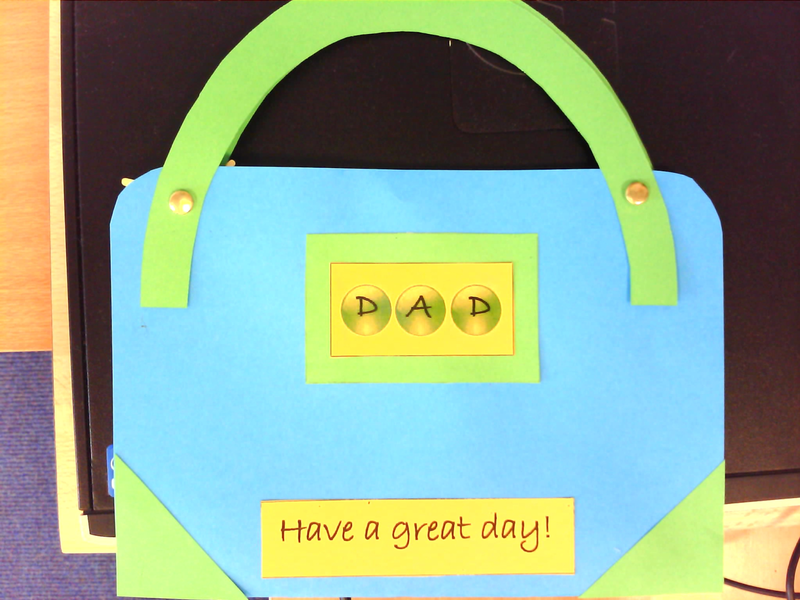 Today in Year 6 (Chestnut and Sycamore) we created Father's Day cards to give to our Dads on Sunday 15th June. We made it look like a brief case - which everyone thought was quite clever - by cutting out green card handles and blue card cases. We followed a computer instruction list and needed only a little help from Mr Canning and Miss Connolly, which meant it was challenging and fun. Everyone did a great job in the end. We all hope our parents (especially our dads) like it - particularly as we put lots of effort in! We hope everyone has a lovely Father's Day on Sunday. Today we discussed important matters about our School Motto (AIM HIGH). 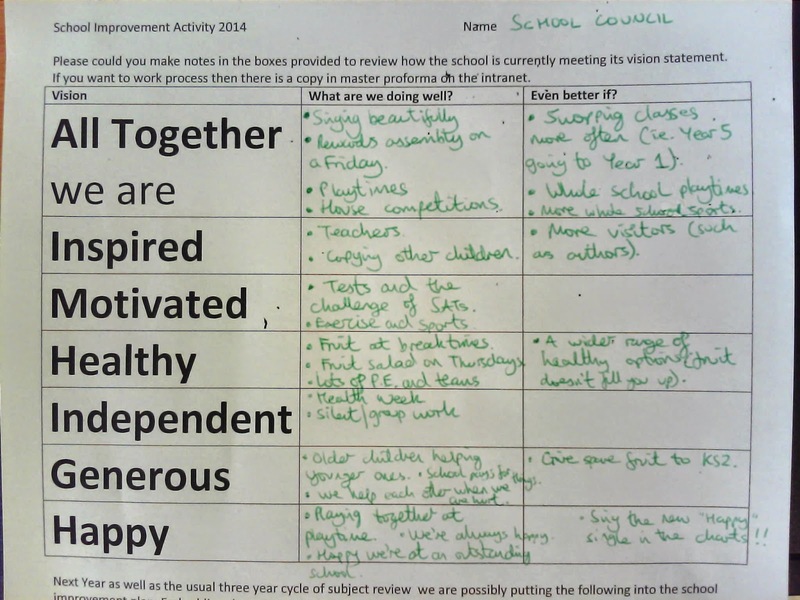 We looked at how well the school is doing in the different areas of our motto and then we focussed on any improvements. We worked initially as pairs and discussed the pros and cons of each part in a systematic way going down to each word. Then we came back together as a whole School Council to present our findings. Hopefully you should be able to see a photograph of our completed task. If you want to add anything please speak to your School Councillor. That is our school Motto and we should respect it at all times and work to the best of our abilities in order to maintain our excellent reputation of our school! On Saturday 31st May 2014, Chilcote Primary School participated in a tennis match against Hall Green. In total we played 58 matches and won 34! The Matches were played half court singles, first to seven with orange balls. We were incredibly pleased to win but it was the taking part that counted. We received the trophy which is in the school trophy cabinet.